When Rob was in the hospital a few years ago, my neighbor was so sweet and brought us the best dinner. It was this amazing Poppy Seed Chicken casserole. I finally decided to make it myself and it has become one of my favorite dishes. It’s great to make ahead for those potluck dinners or a freeze ahead meal for those busy week nights. Looking for an easy dish to make ahead? 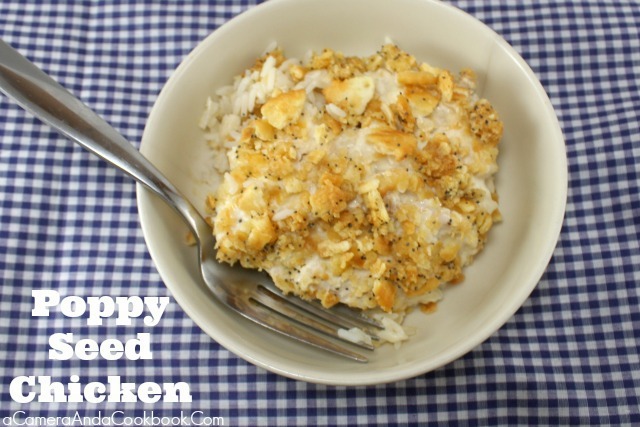 Make this Poppy Seed Chicken for that busy weeknight ahead. 3. Mix together chicken, soup, garlic powder, shredded cheese, and sour cream in a large bowl. 4. In another bowl, mix together crackers, poppy seeds, and melted butter until butter is completely mixed through. 5. Spread rice on bottom of casserole dish. Then top with chicken mixture and spread out evenly. Then, top with cracker mixture. Spray a baking dish 9x13 with non-stick spray. Mix together chicken, soup, garlic powder, shredded cheese, and sour cream in a large bowl. In another bowl, mix together crackers, poppy seeds, and melted butter until butter is completely mixed through. Spread rice on bottom of casserole dish. Then top with chicken mixture and spread out evenly. Then, top with cracker mixture. Bake for 15 minutes with a piece of foil over top. Remove the foil and continue to bake for another 15 minutes.